A new season is here, with styles that would have made one gag just a few years ago. Take cargo pants, for example. Casual, bulky, and with a military flair, these lightweight, large pocketed trousers are using different co-ordinations to present a cool look. 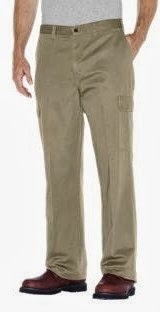 Consider a pair of khakis that have a similar style as cargos. A tee or button-down shirt can make a nice combination with a pair of khakis, but cargos have many more advantages. Anything leather is hot for an amazing look for a stroll down the street. Top this off with a pair of high-topped military leather boots to create an air of confidence. A more subtle, clean-cut look can be achieved by using a long-sleeved knit sweater, tucked inside cargos with a well-fitting waistline. Choose a wool pressed open vest with matching belt, and watch the ladies swoon. Depending on your attire, the pants legs can be left long or rolled up slightly. Men's pants sporting a cargo style are no longer sloppy looking with exact sizes for every waist, plus different designs of pockets that fit any lifestyle. Colors can be found in black, brown, green, blue and grey, for putting together multiple outfits. More comfortable and better fitting than cargos in the past, this style could be around for longer than one season.